This toilet roll holder with phone shelf proves that humanity has really gone too far. The phone has grown to be an indispensable device in our lives. We even have to carry it around in the tiniest room in the house. The toilet has never been too accommodating to our smartphones though. If you don’t have a big toilet chances are you have no choice but to keep holding the phone in your hand. Especially when it comes to wiping, holding your phone at the same time is risky business. I think this is the number one reason why smartphones have become water proof over the years. This antique looking toilet roll holder has a handy shelf that you can put your phone on. It’s a true phone throne. You’ll have both hands free to tidy yourself. No danger of dropping your phone anywhere. The roll holder includes a hook you can hang anything else on, like a towel, brush or a piece of clothing. You can attach this to your wall either side, depending on which side you prefer to shove your toilet roll on. 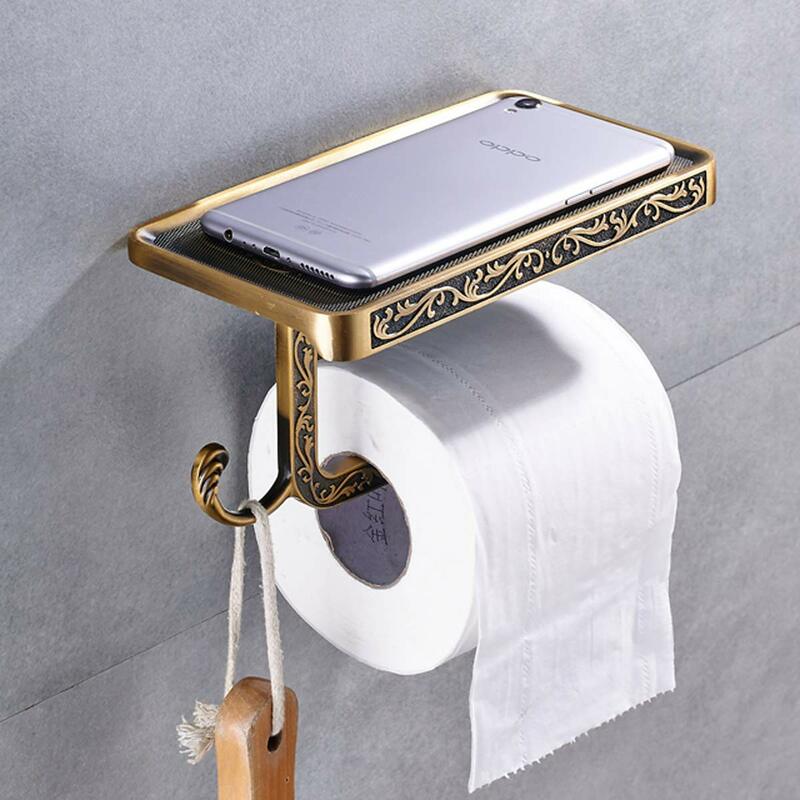 You can buy this toilet roll holder in multiple colors; white, brown, silver, rose gold or regular gold to go with your toilet, or your phone. Get this product if you have ever dropped your smartphone in the toilet, your phone will thank you for it! 1.Heavy Duty: Construted of premium grade zinc alloy, ensuring durability and dependability,content to protect against corrosion & rust. 2.Multi-Function: The shelf is great for putting mobile phone, key, ashtray, watch, glasses and other little gadgets on. 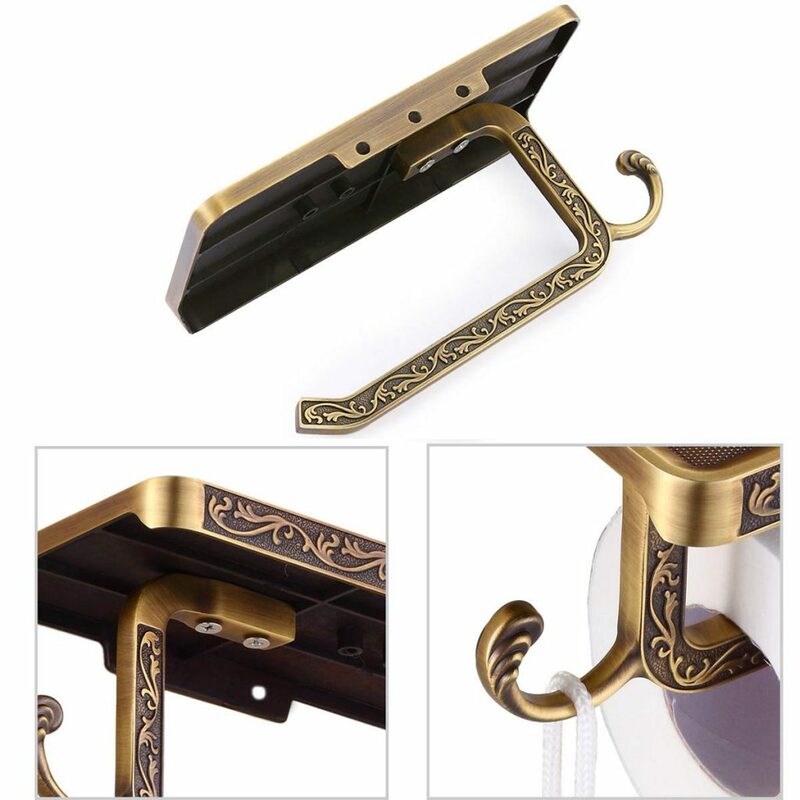 Exclusive design,anti-skidding design for the hook, shelf, and paper holder, 3-in-6 multi-function, wall mount bathroom storage organizer.